The tour operator Continental Journeys is highlighting its Austrian Romantic Road trips for spring and summer family travel, because of the route they take and the flexibility they offer with self-drive packages. Daily departures are available any time between April 1 and Oct. 31, 2011, making them a good option for families who are interested in Austria alone, or would like to combine a week there with other parts of a European itinerary this summer. The traditional Romantic Road itinerary crosses the upper and lower parts of the country from Salzberg to Vienna with an itinerary that's best suited to kids who enjoy some driving, passing scenery and history. 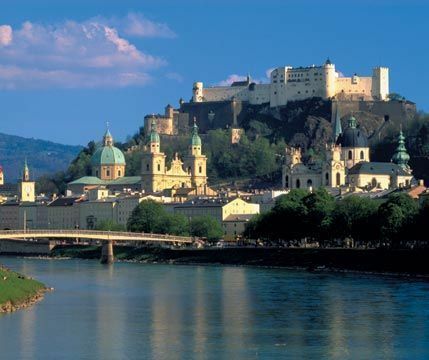 The first day is spent in beautiful Salzburg, city of the "Sound of Music" and the hometown of Mozart. Explore, get a good night's sleep then, after breakfast, drive from Salzburg to Mondsee to see the famous church in Mondsee where the marriage of Maria from the "Sound of Music" was filmed. Continue further on to St. Gilgen at the Wolfgangsee for Mozart sites, a nice lunch or a swim in the Wolfgang Lake. The afternoon and evening is spent in Bad Ischl. On Day 3, families can stop at the World Heritage Museum in Hallstatt, or take a boat trip on the Hallstattersee, then return to Bad Ischl for sightseeing and a rest at their hotel. The next morning, plan to head out to Traunsee, passing Gmunden and on to Steyr, where you overnight. On Day 5, you'll enter Lower Austria, crossing the Danube, visiting Enns, Melk and later the wine region Waxhau. Days 5 and 6, the base is a hotel is in Krems, a base for sightseeing in this agricultural region. Day 7 heads on to Vienna via Tulln and Klosterneuberg. There's so much to see in the country's capital — so many museums, palaces, a wonderful amusement park, great restaurants — that you may want to spend a few nights prior to continuing on to Hungary, the Czech Republic or Slovakia. Continental runs many good tours, including a Dracula Tour of Romania that teens will especially enjoy. The Continental Journeys package includes 7N accommodation in hotel category of your choice, all with private facilities; daily breakfast; guided tour of Bad Ischl; visits to the World Heritage Museum in Hallstatt, Steyr, Monastery of Melk; a boat trip on the Danube River; a wine tasting in the Wachau; 7D car rental of a VW Passat or similar, or 7D private car and driver. Of course, the more intrepid self-drive family will save more with this deal. The per person rate for a seven-night vacation based on double occupancy, in tourist class hotels with your own rental car, is $1579. If you prefer a private car and driver, the price rises to $2,079. If your family prefers first class hotels with your own rental car, it's $1,689. If you want to go first class all the way with a private car and driver, it will cost $2,339 each. Children's discounts apply depending on children's ages. The company offers several other organized trips for families; contact your travel agent or Continental to book, 800/601-4343 or visit Continental Journeys.